Dear husband had requested for cakes to give away, he has no special requirement except must be delicious. Woa this is challenging if I am going to try on new recipe. I decided to bake this recipe since there are many positive review in the internet, sure won't go wrong since so many people had tested and given compliments. I didn't expect the ganache filling to be still watery after the cake has cooled, I thought the filling will at least set a bit. Probably due to the substitution for heavy cream but I welcome this surprised outcome. 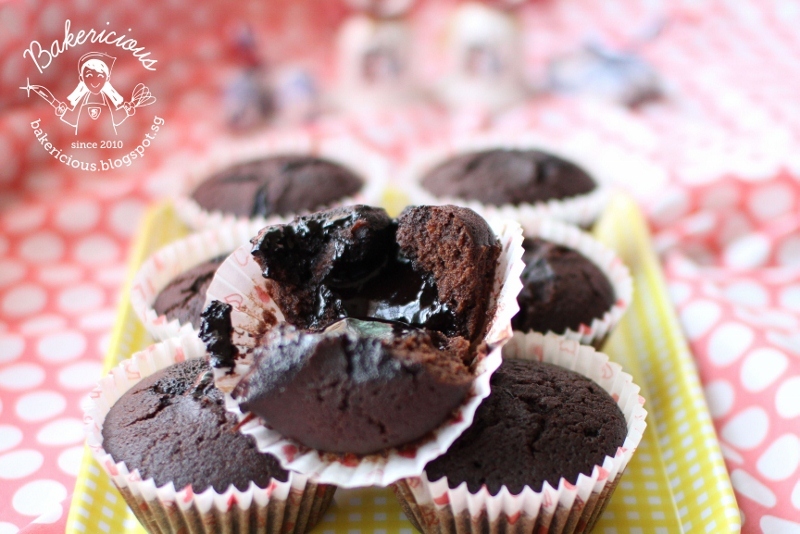 When I "tear" the cupcake apart for photography, the ganache filling just ooze out, seducing me to give it a bite hahaha... I had to control myself so hard to wait after the photo taking, hmmmm.... such a satisfaction after a big bite lol. Oh just in case you might think there is a typo error of using bread flour for this recipe. The answer is no, the recipe is calling for bread flour, this is to make the cupcakes sturdy but not tough to allow more chocolate to be added. 1. Place chocolate, cream, and icing sugar in medium -microwave-safe bowl. 2. Heat in microwave on high power until mixture is warm to touch, 20 to 30 seconds. 3. Whisk until smooth, transfer bowl to refrigerator and chill for 30 mins. 1 Preheat oven at 180C and line muffin pan with cupcake cases. 2. Place chocolate and cocoa in medium bowl. Pour hot coffee over mixture and whisk until smooth. Set in the refrigerator to cool completely, about 20 mins or more. 3. Whisk flour, sugar, salt and baking soda together in a medium bowl, set aside. 4. Whisk oil, eggs, vinegar (or lemon juice) and vanilla extract and mix into step 2 and mix until smooth. Add flour mixture and whisk until smooth. 5. Divide batter evenly among muffin pans cups. Place one slightly rounded tsp ganache filling (I scooped almost 1 tbsp) on top of each cupcake. 6. Bake until cupcakes are set and just firm to touch, 17 to 19 mins (I baked mine for 15 mins). The cake is soft, tender, moist without being too crumbly. This cake is so rich and chocolaty, the surprise ganache filling is making the cupcake marked perfect, this is definitely a chocoholic's dream. I even received compliments such as this is by far the most delicious chocolate cupcake, better than famous bakery stores etc.... I am going to make more to give away! Looks lovely! 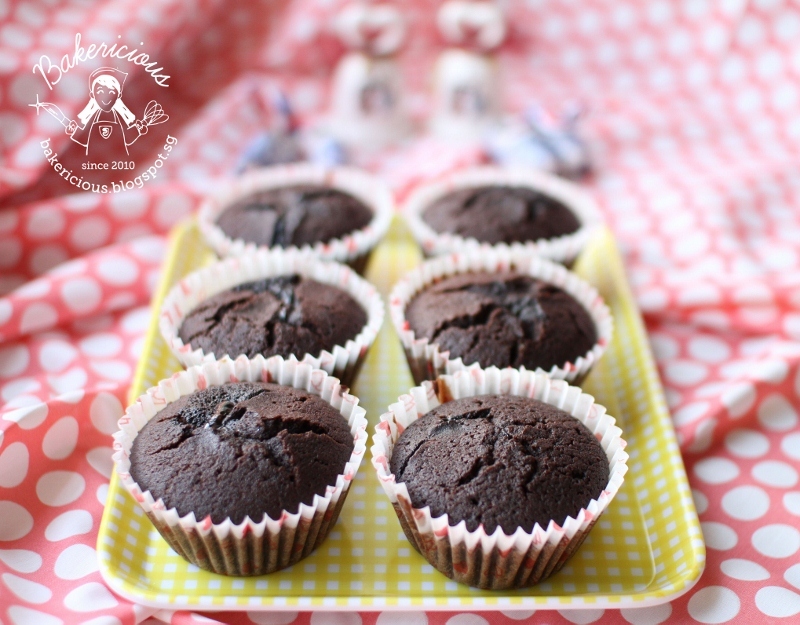 Like mini-molten chocolate puddings! I think the full cream milk with chocolate would make a lovely chocolate sauce whereas I know that on cooling, the chocolate and cream becomes firm. Either way, it looks divine! OMG....those cupcakes certainly come in abundance. woa! These cakes are literally PERFECT! Hi Plumleaf, yes these cupcakes are like lava molten cake, the oozing out filling. I also thot that the filling will set but no leh, still in liquid form but very yummy. Yee Ling, yes you are very rite :D.
Hi Anh, totally agreed with you :). 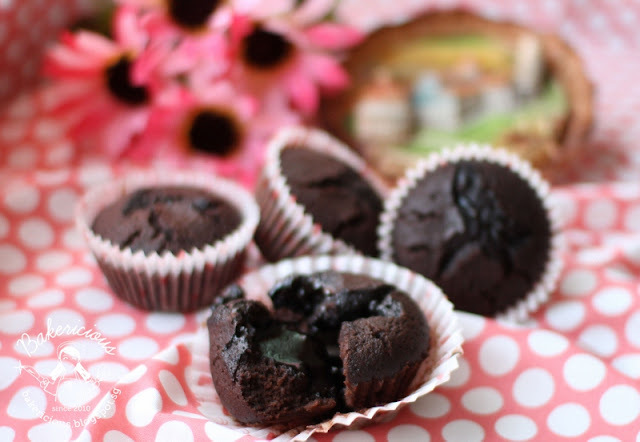 wow, your chocolate cupcake look way too tempting and good! Hi! can i ask what bittersweet chocolate do you use? the cupcake that i baked did not have the flowy centre ): and i dont know why but my ganache filling was crumbly. Hi Michelle I am using 55% couventure chocolate from Phoon Huat. I am not sure why your ganache is crumbly, may be you have over mixing? If you want to have the flowy center, you can increase the amount of heavy cream or milk.